Gold stood alone with gains among precious metals Thursday. Palladium was the biggest loser on the day, plunging 3.6% after scoring a record on Wednesday. Gold for February delivery rose $1, or less than 0.1%, to settle at $1,243.60 an ounce on the Comex division of the New York Mercantile Exchange. "If gold was ever going to stage a meaningful rally it will be now: stocks and yields are falling and dollar is isn’t doing too great either, apart from against commodity currencies, owing to the ongoing risk-off trade," MarketWatch quoted Fawad Razaqzada, technical analyst with Forex.com. 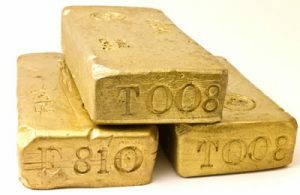 Gold futures ranged from a low of $1,240 to a high of $1,249.90. They shed 0.3% on Wednesday, gained 0.6% on Tuesday — marking their best close since July 12, and they rose 1.1% on Monday. Silver for March delivery lost 7.3 cents, or 0.5%, to settle at $14.509 an ounce. Silver futures traded between $14.41 and $14.59. They declined 0.4% on Wednesday, they advanced 1% on Tuesday for their strongest finish since Nov. 5, and they jumped 2% on Monday. January platinum fell $12.40, or 1.6%, to $789.60 an ounce, ranging from $785 to $803.80. Palladium for March delivery sank $42.50 to $1,141.90 an ounce, trading between $1,135.80 and $1,188.30. On Wednesday, they settled at a record of $1,184.40 an ounce. Gold rose $6.65, or 0.5%, to 1,242.55 an ounce. Silver declined 10 cents, or 0.7%, to $14.38 an ounce.